This is the card I made for my friend Deb for her Birthday. If things go according to plan she has now received this card at a morning tea we are having for her and it is safe to post these pics! 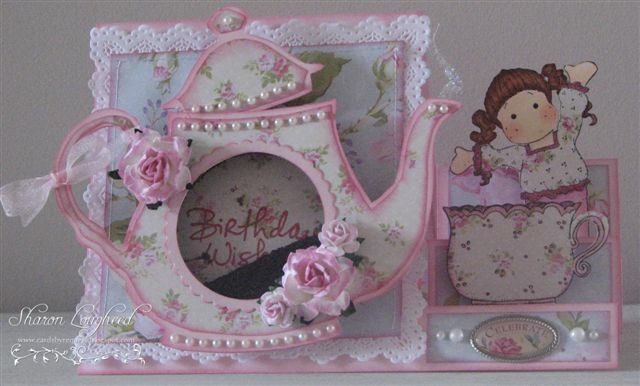 I have combined a Teapot Shaker card (yes they are real tea leaves!) 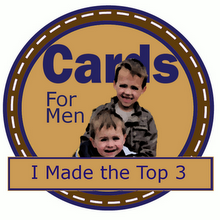 with a step card. This is the first time I've tried either type of card. The pattern for the teapot came from the latest Magnolia Magazine (Cosy Autumn). The papers I've used are by papermania along with SU Pink Pirouette cardstock. The edges are inked with a colorbox chalk pad. 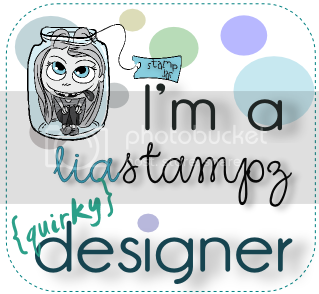 I also stamped the Magnolia cup and Tilda's Shirt in the same pattern paper. The steam rising from the pot is a piece of acetate with stickles applied to it. 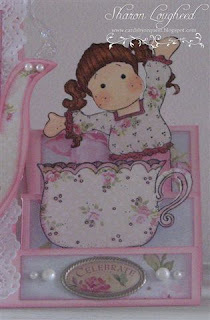 This little "Celebrate" embellishment has been in my stash for ages and was a perfect fit. OMGOSH Sharon!! Let me pick myself up from the floor hheheh WOW I love this!! I love the tea leaf shacker heheh and the teacup and Tilda and the Teapot!! WOW your friend Deb is very lucky to have received such a fantastic card!! Thankyou so muh for sharing it with us at MDUC this week!! WOW WOW and Double WOW - I sure wish I was the Deb this beauty was meant for - LOL. Amazing job! LOVE the shaker coffee pot - awesome job! Thanx soo much for joining us at MDUC this week! 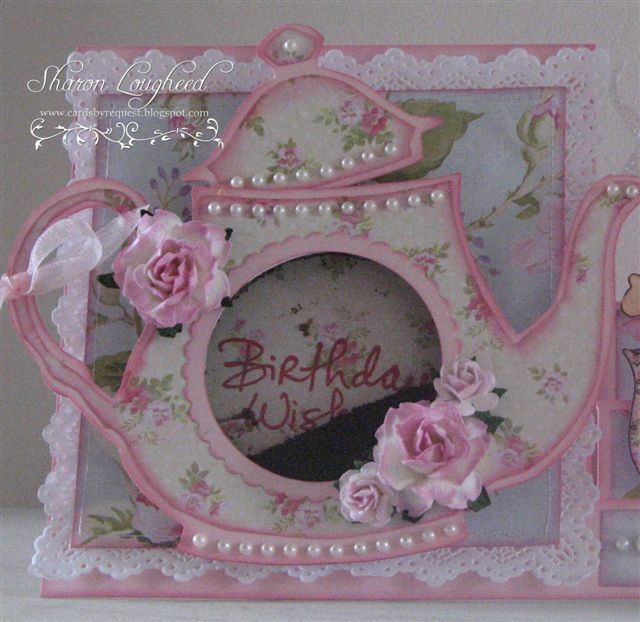 Georgeous creation in lovely colours, beautiful design and details! Very delightful and elegant! Thanks for joining us at WOC this time - best of luck! Thank you so much for my gorgeous card. This is definitely one for the pool room! Wooow so elegant!! Love your creation, and I have never seen anything like it before! It's so gorgeous! And congrats on being the winner on MDUC! wow such a delightful card. 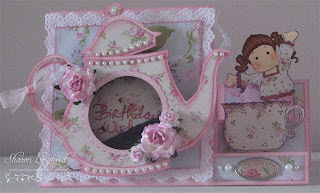 Love the teapot, very beautiful design. WOW,This is just amazing!!! Lovely decoration and beautibul colors!! OH Sharon this is just BEAUTIFUL!!!! STUNNING in fact!!! Congrats on your win with MDUC!!!!! Awesome work Sharon!! This is outstanding, I'm sure your friend loved it!! Woe, Sharon, I just adore this card. So, so pretty and what a lovely theme! 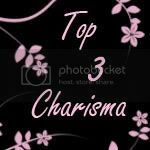 Such a lovely card.Thanks for playing with Charisma. Sharon it's the best one yet, I think even tho it was for Deb we all got a thrill just being there to see her open it yesterday - WOW!!! You set the stardard high and just keep pushing us higher. I love it, incase you didn't know yet! I also had a great time doing your class yesterday - girls get yourselves booked in; you can learn from Sharon at Montville in Creations in Paper card shop owned by the lovely Julie. 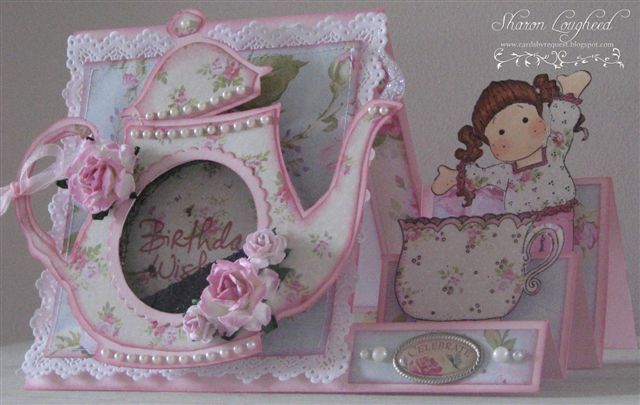 Sharon, could I ask a quick question... which Magnolia magazine issue did you get the teapot template from... your creation is lovely and I wouldn't mind having an attempt myself. Oh this is fabulous!! I love the shabby look of it!! Such pretty papers and details and this is one of my favorite Tilda's!! This card is stunning,i love every fine detail !Congrats to your first place ! your card, and I bet your friend Deb did too. OMG this is AMAZING and absolutely GORGEOUS!!! I love everything about it!! hai Iam a new folower off your blog I see this card amazing your work on this card so gorgeous !! !